After taking the last couple April Fools’ Days off, we decided to do something a little different this year—and not just because today is April 2nd. Around Christmas, staff writer David Schwarz created the Twitter bot Star Wars Hot Takes, which does pretty much what it sounds like, tweeting an auto-generated Star Wars take/thinkpiece title once an hour—many of which you could easily imagine someone throwing together as clickbait, and some of which, I have to admit, sound very close to actual ETE articles. Truthfully, I think the term “hot take” is a little overblown as a criticism; it’s a category people use to reflexively dismiss big swaths of content they don’t like without much regard for the thought put into it. The key difference between a good piece and a “hot take”, in my opinion, isn’t the point of view expressed but how thoughtfully it’s presented—and I absolutely go out of my way to highlight takes on ETE that are distinct and outside the norm (even when I don’t necessarily agree with them) so that they can be given a thoughtful and balanced airing. With that said, another important principle of this site is to not take ourselves too seriously—it’s just Star Wars, and there’s nothing wrong with acknowledging that everyone’s opinions can get a little overblown once in a while. 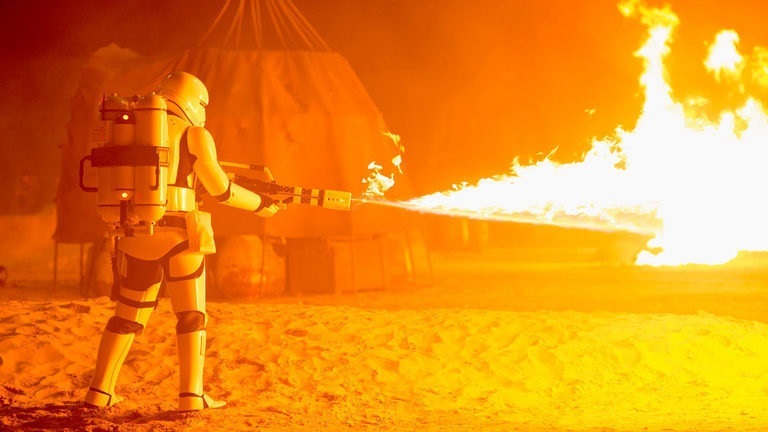 So in the spirit of taking just a little air out of our sails this April Fools’, I challenged the staff to pick a Star Wars Hot Take tweet and develop it into a “serious” mini-editorial. Here’s what they came up with. Ben C: Of course these here crystals are socialist. You take one kyber crystal by itself and it is no threat to anyone, but you take one and its friends and you add them all to a turbolaser and all of a sudden their collective firepower goes through the roof. Figures the Empire would love them, so it proved – they could not crank out the kyber-powered turbolasers fast enough, but for some people – and the Empire is one of them, a turbolaser just isn’t enough gun. Nope, if you can have turbolasers, why not a superlaser? And what do these little crystal bastards do to a superlaser you ask? Why, they enable it to rip a planet apart by their collective, socialist attitude as they pool their ability to raise the power level. Nor is this a new thing either. No, those now-long-dead elitist bunch of bastards, the Jedi, all used kyber crystals. Yeah, those no-wage-earning, acting-for-the-good-of-all, holier-than-thou, mind-reading, latte-sipping, lightsaber elitists. Without the kyber crystals they wouldn’t have even had their fancy lightsabers, wouldn’t have been able to lord them over everyone else. But, of course, just when you think one elite’s gone – another replaces it and the Empire’s use of these crystal socialists was far more ambitious than the Jedi’s. Not that it’ll stop with a Death Star you understand, no, no, no. What’ll happen is someone will go the next step, if kyber crystals can collectively screw over a planet, then why not a star? Why can’t they be used for something like…a Starkiller? And on and on it goes. It’s not new either. Ages ago, some other ancient bunch of super-bastards used kyber superweapons – the Jedi stopped that. Or did they just steal the supply for themselves? Doesn’t matter much either way. Kyber crystals have been a collective plague on the galaxy for millennia and they’re never going away. Jay: We’ve talked a lot about who Snoke might be. But we’ve missed something important, and that is: who does Snoke think he is?! It’s bad enough that he acts as if he is some sort of revivified Palpatine, complete with usurping the Emperor’s old musical cues. But Snoke is not fit to wear the Emperor’s boots, literally or figuratively. It was said of Napoleon I and Napoleon III that “history repeats itself — first as tragedy and second as farce.” No truer words could be said about Palpatine and Snoke. While the fall of the great Emperor was indeed a tragedy — a tragedy that was the culmination of six films — the end of Snoke was at best a laugh line partway through a movie that considered him an afterthought. We knew not to take him seriously when we saw his absurd head and ridiculous diction in The Force Awakens, but little did we know the true depths of his vulgarity. His throne room is at best a shallow travesty of the Emperor’s. His clothes? There have been retirees with better imagination than that “Supreme Leader” in his golden bathrobe and slippers. He could have worn anything on his feet — with those long robes, we wouldn’t have noticed. But he chose to wear those slippers. I can only think it is because of his sublime contempt for everything that came before. He not only wishes to humiliate his enemies, but also those who serve him. It’s surely on purpose. He’s gathered a series of old former Imperials to serve him, and he knows that they have to abase themselves bowing before a slipper-wearing demon clown. What does that do to a person? And what does it do for the legacy of Palpatine? Much is said about Kylo Ren’s attempts to be a new Vader, but little of Snoke’s attempts to be a new Palpatine. Unlike Kylo, Snoke is not just a bad imitation: he’s an insult. We don’t take Snoke seriously and as a result, we may end up taking this entire archetype of evil overlord less seriously. And if we do that, we undermine the core of the entire Star Wars saga. Mark: Machete Order has gained traction as a “preferred” viewing order for people coming to the Star Wars saga for the first time – playing through IV and V until the “I am your father” revelation, switching back to II and III to show Anakin’s fall, and then rounding out the story with his redemption in VI. Though complicated by the releases of Episodes VII and VIII and Rogue One, there is a more fundamental problem with it: it skips The Phantom Menace. And that’s an issue not because of the podrace or Duel of the Fates – it’s wrong because you’re skipping Jar Jar. Jar Jar is the symbol of the living Force, of symbiosis and balance between all living beings. When Qui-Gon and Padmé show compassion and kindness to him, he becomes the catalyst for uniting the Naboo and the Gungans to defeat the Trade Federation, symbols of selfishness and disharmony. Jar Jar sets an example for the galaxy to follow for the rest of the saga, and becomes the ultimate representation of the central message of Star Wars. Jar Jar is the key to all this. Skipping TPM also means you miss the most tragic arc in the entire saga – Jar Jar’s descent from exuberant clown and political icon, to a cog in a corrupt machine. Forget Alderaan – without Jar Jar’s fall, you cannot possibly understand the true evil of Palpatine and the Galactic Empire, the way it crushes the fun, kindness and harmony from the galaxy. Jar Jar is essential, and the saga is incomplete without him. He is the thing the Rebels are really fighting for. He is the balance of the Force. And taking him out is a machete to the heart of Star Wars itself. Mike: Why does this cost thirteen dollars? According to Amazon the total “item weight” is 2.4 ounces, and from the photo I’d guess 2.1 of that is the packaging. 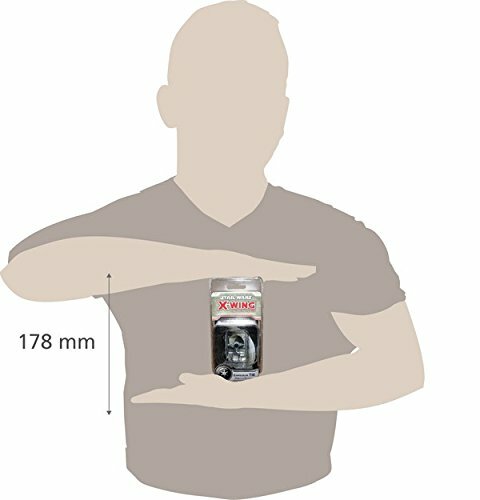 Amazon even included a helpful second image to show how tiny even the packing is in relation to a human being who, despite lacking a face, seems perfectly sane and reasonable yet is actually interested in purchasing this thing. What could he be thinking? Nothing, that’s what. 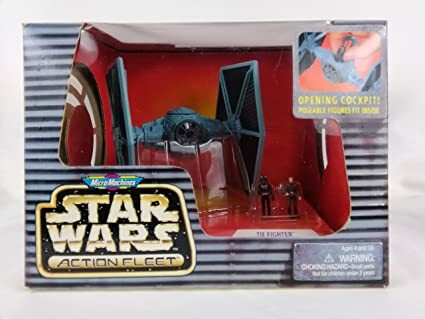 When I was a kid roughly the same amount of money could buy you an Action Fleet TIE fighter that was several times bigger, more detailed, and came with two little pilots! Somehow this tiny version is just as valuable because it’s got a little base with some numbers on it and a card or two with some other numbers on them? I call shenanigans. But shenanigans are just the beginning. Step one was to take merchandise fans already loved and make it as small as possible through the mystical process of “gamification”. Step two is probably something with Funko Pops. Step three? No merchandise at all. Instead of buying physical objects, we’ll have to pay Disney a monthly subscription fee simply to be Star Wars fans. All of fandom will exist in the cloud, where we can only access our virtual Star Wars collections—each item of which will still cost a minimum of thirteen dollars, mind you—with our Subscriber Headsets™ from ILMxLAB. We have to draw the line here, I say! Just say no to X-Wing Miniatures, or before you know it, they’ll be releasing 3.75″ “Black Series” action figures and the regular ones will be an inch tall. Next it’ll be sixteen-piece Lego Millennium Falcons for five dollars. Last but not least, the Disney streaming service will start offering Star Wars-y incentives like custom avatars or wallpaper or, eventually, digital action figures. Then before we know it, cheap plastic Star Wars nonsense will be gone forever. Hey wait, maybe that’s not such a bad idea. Ben W: Let’s break this one down a little bit. First of all, the footage of the moon landing that we all know and probably saw in school or on the History Channel is not actual footage of us landing on the moon. I’m not saying that we haven’t landed on the moon, only that the footage we’ve seen is falsified. After all, what’s the point of landing on the moon if we don’t have grainy, shaky footage of it to lord over the USSR? But, you may ask, why would the director of The Force Awakens, Mister Jeffrey Jacob Abrams, be the one to apologize for faking the moon landing? Remember, the Apollo Moon landing dates are July of 1969, and Mr. Abrams was born in 1966, thus he was three years old when the landing took place and not in much of a position to fake anything. So how could he be involved to the point where he now feels the need to make a massive blockbuster movie as an apology? To understand this whole scenario, we also have to understand the reality of time travel. A sort of eerie presence has prevailed over several of the directorial choices for the recent Star Wars slate. Perhaps taking a jaunt into an alternate timeline where Josh Trank, Colin Trevorrow and Lord and Miller had completed their films is what drew Kathleen Kennedy back to people like Ron Howard and Mr. Abrams as “correct” picks. But why was Mr. Abrams the correct pick? Because of his existing familiarity with time travel, of course. There’s a reason that time travel factors into his others works as much as it does. Mr. Abrams has been using time travel to help select his projects for years, picking which ones will be the biggest box office draw or raise his profile as a producer higher. And once, only once, he stepped back through time to help produce the highest-profile project of his career: the falsified moon footage. Of course, Kathleen Kennedy knew this; she is one of the few, considering that it was Lucasfilm’s time travel tech that has made it possible. But she only found out about it when she took over the company from her flannel-clad predecessor. So when she was searching for a director for The Force Awakens, she knew exactly who to rope into the job. Blackmail is an ugly word, so in internal discussions between her, Mr. Abrams, and the Story Group, she framed the whole production as an “apology” on behalf of Mr. Abrams to the rest of the world. As to why Matt Martin of all people was the one to hint at this being the case, the reason is simple. He’s one of the most recently initiated into the Story Group circle, heard the story of TFA’s production second-hand, and hasn’t learned when to keep his mouth shut.